Scene setting: Aitor Throup returned to the catwalk with a tight collection of trans-seasonal prototypes that were presented across three acts. The show was something of a self portrait as Throup has spent the most part of his ten-year career invested in the development of what he called ’hermetically sealed concepts’ – not fashion. Guests arrived to his S/S 2017 show to find a sculptural installation entitled The Resting of the Past made up of four life-casts made to his own exact measurements, dressed in prototypes from concepts that were last shown in 2013. Lain on top of one another as if discarded, they preceded a performance with six looks presented on articulated dummies, operated by puppeteers. The clothes shown – hooded sweatshirts, quilted parka jackets – will go on to inform a fully, commercially distributed collection that will be released early next year. Team work: Theatre director, dramaturge and puppeteer Rachel Warr, worked with Throup on the show’s evocative choreography. She tasked five puppeteers to bring an articulated, life-sized mannequin to life – and in so doing reanimated the theatrical aspect of fashion long since lost in an age drawn to the immediacy of the flat image. 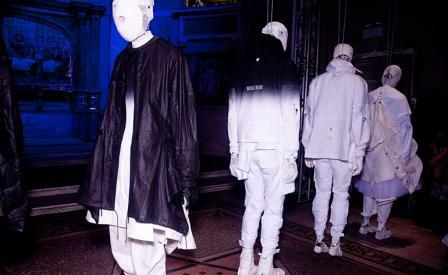 Throup’s collaboration with Warr brought not only his conceptual thinking to life, it has blown some dust off the conventional catwalk show too.